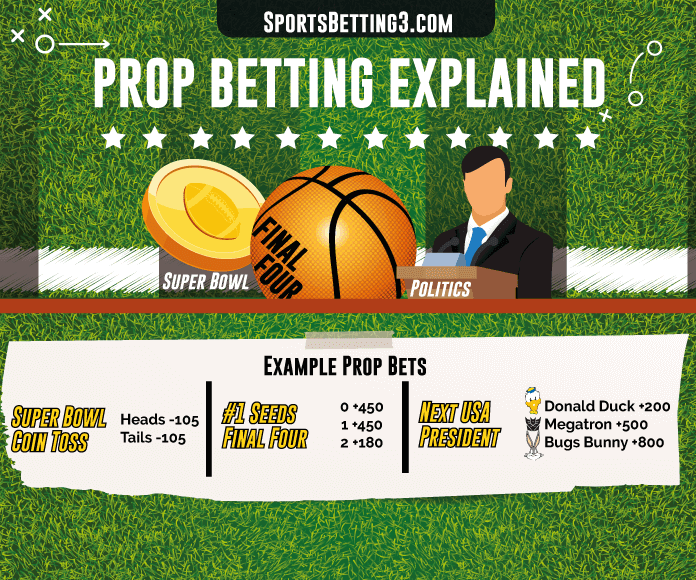 Prop betting explained. These fun bets are available for sports, entertainment or politics. Are props sucker bets? Learn what positive and negative moneyline numbers mean. Know when to combine a player prop with a single game straight bet. Only bet entertainment or politics with inside knowledge. Sportsbook offers odds on various events related to sports, entertainment or politics. Bettor decides whether an event will occur, in what quantity or both. Prop bets are considered side bets. They are not dependent on the game or contest final outcome. Visit sportsbook prop bet page. See also “Specials”. Select sport, entertainment or politics. Each event has moneyline odds. Make selection and bet desired amount. Exotic bet. Major events like the Super Bowl, March Madness and league championships will have extensive prop betting opportunities. Sportsbooks will offer entertainment and political props as newsworthy events approach. Sports props win or lose after applicable game, season or playoff period has concluded. Entertainment and political props result after applicable show or vote period has concluded. Some props cannot be added to parlays. See sportsbook rules. Anything related to a player’s stats can be a prop. Common single game examples include the number and variety of points, defense, fouls, turnovers and scoring method. Sportsbooks also offer team props. Single game examples include point scoring method, defensive performance or coaching decisions. Season win total betting is popular among savvy bettors. Choose whether a team’s total wins will be over or under the sportsbook’s line. Season win total props are sometimes called season win total futures. Novelty props include color of Gatorade thrown on a winning coach, number and variety of touchdown celebrations or the first play a quarterback calls. Sportsbooks occasionally offer lines on an award show, celebrity or political campaigns. These props are generally used for marketing purposes. Most of these props are sucker bets. Others could be profitable with the right knowledge. Examples include the US presidential election, Academy Awards and Grammys. Individual celebrities will get props if they are in the news cycle. Prop Bet odds are listed as moneylines. Read more about betting the moneyline here. Will the result be heads or tails? Bettor chooses Heads laying $105 to win $100. See our March Madness Betting page. How many #1 seeds will make the Final Four? Bettor chooses 3 #1 Seeds in the Final Four laying $100 to win $500. How many times will a candidate say “American Dream” in victory speech? Bettor chooses 4 laying $100 to win $180. Prop bet wins if prediction is correct. Bet loses if prediction is incorrect. Sportsbooks refund bets for canceled games or events. Bets will also be returned if determining a result is no longer possible. Positive numbers indicate how much you win for risking $100. Negative numbers indicate how much you risk to win $100. Coin toss produces a “Heads” result. Bettor wins $100 for $105 risked. 2 #1 Seeds make the Final Four. Bettor loses $100. 3 #1 seeds did not make the Final Four. Candidate says “American Dream” 4 times. Bettor wins $180 for $100 risked. Suppose the NFL replaces the coin toss with a lottery an hour before kickoff. The Coin Toss prop can neither win nor lose because the procedure changed. Sportsbook returns player’s $100 Heads bet. Easy to bet. Pick the most likely option. Sportsbooks list props with moneyline odds. Some sporting events have multiple prop betting opportunities. Think Super Bowl, March Madness, NBA Championship or Stanley Cup. Props add excitement to games, award shows and political events. Sportsbooks load props with juice. Props with 2 or more possible outcomes are big winners for the house. Tough to reliably predict winners without expert knowledge. Single game betting is preferable for consistent profits. Sportsbooks use entertainment and political props as marketing tools. They are mostly sucker bets unless you have inside information. Prop bets tie up bankroll. Bet small amounts. Use bankroll for straight bets, teasers or parlays instead. Shop odds. Multiple sportsbooks will have lines for the same props. Choose the sportsbook offering the greatest profit potential. Game result and prop outcome can be related. Consider a star player’s impact on his team’s final point tally. Note that game result does not affect whether a prop bet wins or loses. Wait until the last minute before placing a prop bet. Acquire the most information possible. Surprise changes, injuries and news may impact your bet’s profitability. Place related straight and prop bets together. A Super Bowl quarterback’s passing performance may impact his team’s ability to win. Place 2 bets. Bet a prop on the quarterback’s number of completed passes. Then take his team to win against the spread. Note, sportsbooks only offer player props for major events. Super Bowl Interceptions – How many interceptions will a Super Bowl quarterback throw? Super Bowl Safeties – Will there be 1 or more safeties in the game? March Madness Cinderella – Choose the lowest seed to make the Final Four. 3 Pt Pay Day – Will a NBA Championship team score more than 15 3 pointers? Academy Awards Picture of the Year – Choose the likely best picture from a list of nominees. Stanley Cup Rumble – Will a known enforcer get more than 3 major penalties in the final game? Bookies likely offered the first prop bets in the late 1800s when baseball leagues formed in the USA. Early props were considered side bets. They were popular with casual gamblers. Serious bettors stuck with straight bets on the eventual winner. Prop bets later migrated to Las Vegas when the state legalized sports betting. Bookmaker William Hill popularized prop or “novelty” betting in the United Kingdom during the 1960s. Hill famously offered odds on the Moon landing and JR Ewing from the Dallas TV show. Both bets produced instant publicity and notoriety. Today offshore bookmakers like Bovada offer a bevy of exciting prop bets related to major sporting events and entertainment. Across the pond, European outfits like Paddy Power have made a name for themselves offering odds on the 2016 US Presidential Election. Will any QB throw for 400 or more yards in the game? Will any TD be overturned by replay? Will there be a flea flicker attempt? Will a #4 Seed win the 2017 NCAA Men’s Championship? Will Gonzaga make the Sweet 16? Will a #15 seed win a game in the 2017 NCAA Tournament Round of 64?